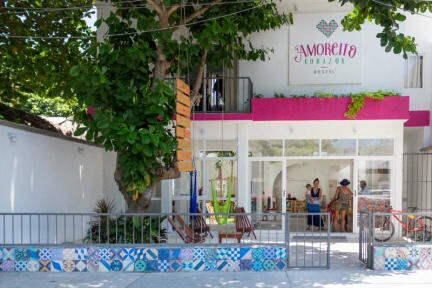 Located in Tulum center, Amorcito Corazon surrounds each guest in a tropical Mexican atmosphere; here you will be able to relax, clear your mind, and enjoy the loving care that only we know how to provide. At Amorcito Corazon, we believe that love is what moves us to be and do all things. We have different kinds of rooms, one option are the beds in shared rooms, each room have 6 beds, with lockers, air conditioning, fan and private bath. Also we have private rooms for 2, 3 and 4 people. Any of our options includes continental breakfast, we have a nice pool in the terrace, shared kitchen, fridge and microwave. Our rooms are spacious, comfortable and clean, with nice decorations. Our business is committed to real care of the environment; we generate our electricity and hot water through solar panels and heaters. Taking care of our planet Earth is not a trend, but a responsibility. We invite you to be part of it. We are located one block behind the ADO bus terminal. Only a few steps away, you will have at your fingertips unbeatable culinary experiences, bars, live music, art and culture, and Mexican handcrafts. Beauty, mysticism, natural attractions, rich culture and arts, fun and exquisite cuisine will not be missing during your stay in Tulum. Its beach is renown as one of the most beautiful in the world. The archaeological ruins, overlooking the Caribbean Sea, are proof of the irrevocable splendour of the Mayan culture. Cancellation policy: 72h before arrival. In case of cancellation within the 72h a cancellation fee of 50% will be charge. In special season (from December 22 - 7 January) cancellation fee will be 100% of total reservation. Note; the room Apapacho is located in ground floor next to reception area. Taxes included. If you need an invoice, 16% tax will be applied. Excelente lugar, muy limpio, muy tranquilo, ubicacion perfecta, me volveria a quedar !!! Tanya es una excelente recepcionista, las habitaciones son pequeñas pero cómodas recomiendo este hostal ampliamente. Una mejora sería fumigar en las habitaciones de ahí en fuera todo excelente. Perfect location!!! 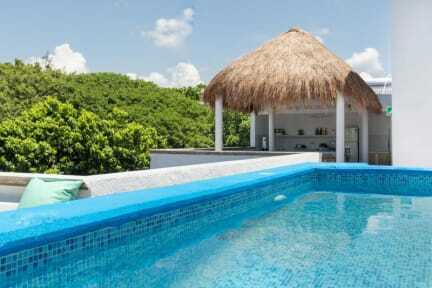 super helpfull staff, very clean, very comfortable If I come back to tulum I will be there again!!!! Hostel muy acogedor por la buena atencion del personal, te alquilan bicicleta, me senti como en casa. Gracias Tania, Heidy,Daniel, Jimena. Nice hostel, chilled ambiance and friendly staff, right behind the bus station in Tulum and in the heart of Tulum town...the only thing you need to keep in mind is the distance from the beach, the hostel is not close to it and the air conditioning has a curfew...overall a nice place to stay if you want to chill and don't mind a 30 min bike ride to the beach. The australian tour guide, Aaron is a cool dude and plans daily tours with the guests.